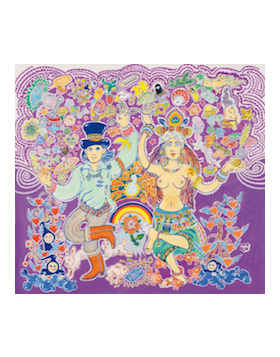 Active since the early seventies, as a cultural agitprop of the alternative scene with the psychedelic magazine "Insekten Sekte", he founded in Amsterdam and spread along the "Hippie Trail". With his unmistakable graphic trait, he collaborates with several counter-cultural publications of the period, from the American "Berkeley Barb" to the Italian "Fallo!". In the Eighties, he is interested in shamanism and traditional cultures, traveling in Japan, United States, South America and Australia. Illustrator, painter, essayist, event organizer, exhibits in Italy, United States, Japan, the Netherlands, Germany, Spain and Switzerland, both in institutional locations (such as the Milan Triennale) and in unusual creative environments. 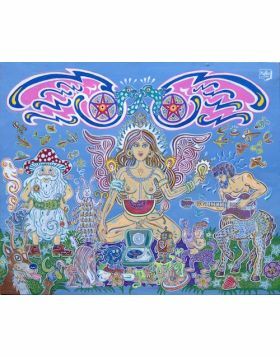 Over the years it has been able to continuously update the psychedelic imagery, re-linking the subterranean ranks of a mystical-evolutionist research that has never been interrupted. His work is an interweaving of echoes coming simultaneously from archaic cultures, modern techniques of psychic analysis, scientific researches on the activities of the mind, all appropriately mixed by robust doses of irony. He has been able to blend different cultural traditions with skill in a single sign, with a style that still remains extremely elastic and magically visionary, able to expand with incredible rutilance (think of the covers of the disks, editorial layouts, but also his canvases ), as well as to settle in those delicious and incisive icons (so open, but stable, together fresh and safe) that represent his production as an illustrator. Active in the field of design (Bruno Munari, Studio Mendini, Italo Rota, Alessandro Guerriero, Alberto Biagtti), journalism (D-La Repubblica, Alias, Gap Japan, Zoom France, Wired, Vogue, Abitare) and fashion (Stephane Marais , Yoox, Vivienne Westwood, Malo, Biba). Historian of costume and art critic, he has published over thirty essays on historical avant-gardes and on creative antagonistic movements. He is one of the few Italian artists present in the prestigious volume "Art of Modern Rock" by Grushkin & King (2004).